Sony KD-65ZD9BU review | What Hi-Fi? We thought we’d seen the last of Sony’s TVs for 2016. But then the company launched a premium ZD9 series of 4K TVs. The Sony KD-65ZD9BU is the baby of the range at £4000, but it boasts an Ultra HD 4K and HDR (high dynamic range), with all the streaming features you could want. The Sony ZD9 has improved technology that promises better detail, contrast and colour, especially for Ultra HD 4K and HDR video. It has an X1 Extreme image processor that offers 40 per cent more processing power than the one in the XD93/XD94 range too. It’s responsible for trying to deliver more accurate detail enhancement, better contrast, and much smoother colour gradation. Backlight Master Drive gives the TV full control over each individual LED in the panel’s full-array backlight, and the 65ZD9 also employs ‘object-based HDR remaster’, which claims to intelligently upscale content to 4K HDR, based on how they should look, rather than just boosting the picture’s contrast and colour. While Sony refuses to join the UHD Alliance and apply the UHD Premium logo that Samsung, Panasonic and LG are happy to show, it is content to adhere to its own high standards when it comes 4K and HDR parameters. Sony claims it goes way beyond the 1000 nits required for HDR’s peak brightness. If it’s a good-looking TV you want as the centrepiece of your home, then the Sony KD-65ZD9BU more than justifies its £4000 price tag. It isn’t the slimmest screen we’ve seen, but even with the few inches of padding on the back, the ZD9 looks svelte and every inch a premium TV. Part of it is down to the sliver of bezel surrounding the screen, which focuses your attention on the picture. The other part is the subtle matt-gold accent on the TV’s edges and stand. It’s not flashy but it does give an attractive flourish which points to the 65ZD9’s premium status at the top of Sony’s TV range. The stand is also a sensible rectangle – not the long ones that span the length of the TV so you can’t fit them on to your TV stand – and is easy to assemble. Even the remote control is nice to hold. The flat, rubber-feel buttons are responsive and intuitive, and the metal back is a nice effect. The grid pattern on the back of the TV looks smart, but it also hides the joints of panels that snap off to reveal all of the 65ZD9’s connections. While other TVs are equally uncluttered and seamless, the 65ZD9’s grid design really makes the panels invisible. It looks cool. You can also feed the cables through the stand to make cable management even neater. Hidden underneath those panels are four HDMI inputs (all four specified to 4K/HDCP 2.2 standards, two allowing HDR – so you can play 4K Blu-rays), an optical output, three USB ports, composite and scart connections, and Freeview HD and satellite tuners. You can connect to your home network using wi-fi, but for a more stable connection, use wired ethernet to make sure you get the full blast of a 4K stream over Netflix or Amazon Video. Android TV 6.0 (or M for Marshmallow) returns as the backbone of Sony’s smart TV platform, however, the system’s updated interface looks virtually unchanged. Depending on your point of view, it’s perhaps not as colourful and fun as Panasonic’s Firefox or LG’s WebOS, but it’s easy to navigate through the orderly list of catch-up TV services, on-demand video apps, Google Play apps and more. Uniquely in our experience, Sony provides all the UK’s catch up TV services – BBC iPlayer, ITV Player, All 4, and Demand 5 – without the need for Freeview Play. There’s even YouView, wuaki.tv and YouTube. Along with the all-important Netflix and Amazon Video, this makes the 65ZD9 one of, if not the most well stocked Smart TVs for video. The layout is neat and speedy, and it doesn’t take long for apps to open or switch over. The programme guide is similarly uncomplicated, and browsing through daytime telly options is quick and easy. Play The Martian and the Sony KD-65ZD9BU dazzles with the 4K Blu-ray picture. The ‘Martian’ landscape looks vast and brutal. You can discern every grain of sand, while aluminium foil and glass sparkle. The grubbiness of Matt Damon’s space-suit, the lines on his face - the Sony is detailed enough to convey these varying textures and more. Blu-rays of Marvel films pop with colour. The 65ZD9 has a slightly rich palette, but in an appealing way. 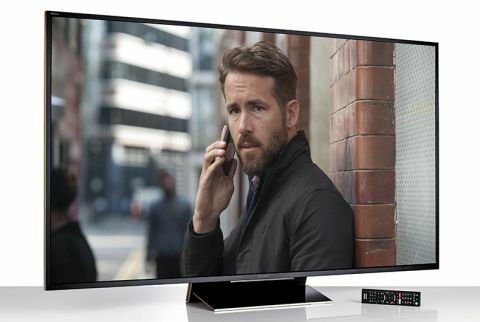 It sits between the subtle, crisp Samsung UE65KS9000 and the glowing, lush hues of the LG OLED65E6V – but the overall balance looks natural enough. Streaming in 4K may not be as defined as a 4K disc, but the quality is a step-up from Full HD. The Man in the High Castle has a gloomy, grey-filtered palette, and the 65ZD9 is talented enough to distinguish edges of objects and characters in the shadowy corners. The opening titles are enough to show how well the Sony can display sharp, bright whites alongside deep blacks – although it takes some adjusting in the picture settings to get this strong contrast. Even after we’ve tweaked the picture using a THX Optimizer disc, there are plenty of options in the settings to make the ZD9’s picture look its best. Our tips? Turn black enhancer, advanced contrast enhancer and auto local dimming to ‘low’ to achieve those deep, intense blacks. It might swallow up some fine detail, but the alternative is slightly greying blacks. We’d also recommend the ‘Standard’ motion option to smooth over the judders that can blight the ZD9’s natural performance, especially during panning scenes. MORE: 4K streaming vs 4K Blu-ray vs Blu-ray - which is best? Sony’s closest LCD rival is the Samsung UE65KS9000, which offers a slightly different colour balance. Its skin tones are a touch reddish while the Sony veers towards pale yellow. However, it’s their black depth and shadow detail that set the two apart. While the Samsung doesn’t go as pitch black as the LG OLED65E6V, it still manages to convey intensity and layers of depth. The Sony, as dark as it goes, doesn’t quite suggest that same impression of depth and detail. Space scenes are best at showing this: you can see the wispy gas clouds surrounding the Milky Way on the Samsung, but not so much on the Sony. You can see more stars shining on the Samsung, too. Even if you brighten the image, the Sony ZD9 isn’t quite capable of revealing the subtle details in shadows or edges of objects. Dark hair looks uniformly black on the 65ZD9, but the Samsung can pick out strands of brown when a light shines on characters. Faces look more three dimensional on the Samsung with the extra nuance around the edges. The 65ZD9 is a fine upscaler, though, with standard- and high-definition Freeview channels comfortable to watch. There are the inevitable fuzzy edges and drop in detail, but bump up the noise reduction settings to smooth over those old MacGyver episodes and it looks fine. Sony hasn’t done anything exciting on the sound front, assuming correctly that owners will want to pair their expensive TV with an appropriately capable soundbar. We agree: the TV’s thin sound will definitely need a boost from the likes of the excellent Dali Kubik One (£800) soundbar. It may sound like we’re nitpicking over the finer subtleties of the Sony’s picture, but when you’re paying £4000 for the best TV, you’ll be aiming for perfection. There’s no escaping the fact that the Samsung 65KS9000 offers a better picture at a much lower price. Still, there’s plenty to like about the Sony KD-65ZD9BU. It’s a lovely set, the world’s best video apps are at your disposal and the picture is still a knockout when you’re watching 4K films and shows.